Joseph L. Cecchi has been a Professor of Chemical and Nuclear Engineering at UNM since joining in 1993. From 2011 to 2012, while on leave from UNM, Professor Cecchi held appointments as Provost and Professor of Engineering at the Masdar Institute of Science and Technology, Masdar City, Abu Dhabi, United Arab Emirates. He was Dean of the School of Engineering at UNM from 2000 to 2009. Professor Cecchi also served as Chairman of the Board of Directors of the Science and Technology Corporation, UNM’s technology transfer organization, from 2004 to 2011. 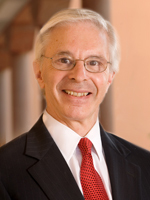 From 1972 to 1993, Professor Cecchi was at Princeton University, where he held joint appointments in the Department of Chemical Engineering and the Princeton Plasma Physics Laboratory, and was Director of Princeton’s Graduate Program in Plasma Science and Technology, and the New Jersey SEMATECH Center of Excellence for Plasma Etching. 1994 - Present Professor, Department of Chemical and Nuclear Engineering • University of New Mexico, Albuquerque, NM. 2011-2012: Professor of Engineering, Masdar Institute of Science and Technology • Masdar City, Abu Dhabi, United Arab Emirates. 1988 - 1994: Lecturer with Rank of Professor, Department of Chemical Engineering • Princeton University, Princeton, NJ. 1984 - 1994: Principal Research Physicist, Plasma Physics Laboratory Princeton University • Princeton University, Princeton, NJ. 1978 - 1984: Research Physicist, Plasma Physics Laboratory Princeton University • Princeton University, Princeton, NJ. 1972 - 1978: Staff Physicist, Plasma Physics Laboratory Princeton University • Princeton University, Princeton, NJ. 1969 - 1972: Research Assistant to Professor, Norman F. Ramsey Department of Physics • Harvard University, Cambridge, MA. 1969 - 1972: Teaching Fellow, Department of Physics • Harvard University, Cambridge, MA. 1967 - 1968: Research Associate, Physics Division Argonne National Laboratorys, Argonne, IL. 2011 - 2012: Provost, Masdar Institute of Science and Technology • Masdar City, Abu Dhabi, United Arab Emirates. 2004 - 2011: Chair, Board of Directors The Science and Technology Corporation @ UNM • Albuquerque, NM. 2001- 2009: Dean, School of Engineering • University of New Mexico, Albuquerque, NM. 2000 - 2001: Interim Dean, School of Engineering • University of New Mexico, Albuquerque, NM. 1994 - 2000: Chair, Department of Chemical and Nuclear Engineering • University of New Mexico, Albuquerque, NM. 1991 - 1994: Director, SEMATECH Center of Excellence for Plasma Etching New Jersey Consortium. 1987 - 1994: Director, Graduate Program in Plasma Science and Technology School of Engineering • Princeton University, Princeton, NJ. 1979 - 1987: Head, Materials Physics Group, Plasma Physics Laboratory • Princeton University, Princeton, NJ. 1987 - 1994: Head, Plasma Processing Group, Plasma Physics Laboratory • Princeton University, Princeton, NJ. Method of Enhancing Selective Isotope Desorption from Metals, U.S. Patent No. 4,476,100, Issued: October 9, 1984. Hydrogen Isotope Separation Utilizing Bulk Getters, U.S. Patent No. 4,976,938, Issued: December 11, 1990. Hydrogen Isotope Separation Utilizing Bulk Getters, U.S. Patent No. 5,041,147, Issued: August 20, 1991. Method and Apparatus for Coupling a Microwave Source in an Electron Cyclotron Resonance System, U.S. Patent No. 5,111,111, Issued: September 30, 1991. Apparatus and Method for Uniform Microwave Plasma Processing Using TE11 and TM01 Modes, U.S. Patent No. 5,302,803, Issued: April 12, 1994. Apparatus and Process for Producing High Density Axially Extended Plasmas, U.S. Patent No. 5,587,038, Issued December 24, 1996. Method of Making Dense, Conformal, Ultra-Thin Cap layers for Nanoporous Low-k ILD by Plasma Assisted Atomic Layer Deposition, U.S. Patent No. 7,947,579, Issued May 24, 2011. Ultra-Thin Microporous/Hybrid Materials, U.S. Patent No. 8,187,678, Issued May 29, 2012. Y-B Jiang, G Xomeritakis, Z Chen, D Dunphy, D.J. Kissel, J.L. Cecchi, and C.J. Brinker, Sub-10 nm Thick Microporous Membranes Made by Plasma-Defined Atomic Layer Deposition of a Bridged Silsesquioxane Precursor, J. Am Chem. Soc., 129, 15446-15447 (2007). J.L. Cecchi, C.J. Brinker, and Y-B Jiang, Ultra-Thin Conformal Pore-Sealing of Low-k Materials by Plasma-Activated Atomic Layer Deposition, ECS Transactions, 11(7) 167-176 (2007). S.M. Han, J.L. Cecchi, and J.J Russell, High Performance Engines: Fast Cars Accelerate Learning, Journal of Engineering Education, Chem. Eng. Educ. 37(3), 208 (2003). M.E. Littau, M.J. Sowa, and J.L. Cecchi, Diode Laser Measurements of CFx Species in a Low-Pressure High-Density Plasma Reactor, J. Vac. Sci. Technol. A 20 (2002) 1603. P. Gopaladasu, J.L. Cecchi, K.J. Malloy, and R. Kaspi, Response Surface Modeling of the Composition of AlAsySb1-y Alloys Grown by Molecular Beam Epitaxy, J. Cryst. Growth 225 (2001) 556. M.J. Sowa, M.E. Littau, V. Pohray, and J.L. Cecchi, Fluorocarbon Polymer Deposition Kinetics in a Low-Pressure High-Density Inductively Coupled Plasma Reactor, J. Vac. Sci. Technol. A 18 (2000) 2122. D.J. Stein, J.L. Cecchi, and D.L. Hetherington, Atomic Force Microscoy, Lateral Force Microscopy, and Transmission Electron Microscopy Investigations and Adhesion Force Measurements for Elucidation of Tungsten Removal Mechanisms, J. Mater. Res., 14, (1999) 3695. D.J. Stein, K.L. Hetherington, and J.L. Cecchi, Investigation of the Kinetics of Tungsten Chemical Mechanical Polishing in Potassium Iodate-Based Slurries II: Roles of Colloid Species and slurry Chemistry, J. Electrochem. Soc., 146, (May, 1999). Dr. Cecchi has authored more than 90 research publications in semiconductor manufacturing, plasma engineering, and materials technology.